There are numerous articles online about the homeowner – painter transaction from the homeowner’s perspective. It is difficult, after reading many of them, not to come away with the impression that painting contractors are shady, untrustworthy characters who take your money and provide poor quality results. There may have been some of that in your father’s time, but today’s painting contractor has learned that success comes to the painter who takes the profession seriously and provides quality work at a fair but competitive price. Knowing that you are a professional with integrity, experience, and craftsmanship, what are your options for getting paid in today’s market? There are three different levels of projects that require different payment options. The first level is the small homeowner painting job that is based on time and material. These types of jobs are usually paid upon “satisfactory completion” of the job. The options for payment used to be cash or check upon completion of the job. Cash was preferred because there was always the possibility that the check might not clear right away. The greatest innovation for today’s painter is the Square from squareup.com. Just set-up their free Square magstripe reader on your smartphone or tablet and swipe your client’s Visa, MasterCard, Discover Card or American Express. The client receives an invoice in their email and the funds are deposited into your account within two days. 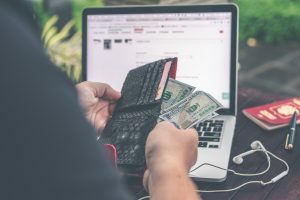 There is a 2.75% transaction charge for the service, but that’s a small price to pay for the convenience and other features like chargeback protection and automated record keeping. There are also apps available on your smartphone or tablet that allow you to accept checks with confidence. Almost every major U.S. bank now has its own banking app. There’s also Zelle, an app from Early Warning Systems LLC. If your client has a bank account in the U.S., funds can be transferred from your client’s account directly into your account with no fees or holding accounts. Both solutions also make the payment process easy for the second level of a project, the custom paint job. These projects are the ones which require you to purchase custom color paints or other supplies before beginning the project. Again, today’s consumer usually understands that these types of custom jobs require an initial payment to cover the cost of materials with the balance due either upon completion or as a series of payments based upon a percentage of the work completed. As a professional painting contractor, you can help yourself by clearly educating your client on such quality determinants as the importance of surface preparation, how higher quality pigments and more solids make a more expensive paint a better value, or the effect of different types of lighting on color temperature. Conveying the quality and long-term value of your custom painting job can often turn the client into an ally and mitigate payment issues. You should also spend the necessary time to communicate the project requirements and establish expectations. On larger projects, your best bet is still having a detailed draw payment schedule tied to a percentage of performance. As in all painting projects, make sure your agreement clearly defines terms like “satisfactory completion” and when final touchups are done. Make sure your client signs off acceptance at every phase of the project and that you have a written change order for every change that is either requested or required. Keep clear and complete records, don’t promise what you cannot deliver, and stand behind the quality of your work. If you are a subcontractor, make sure you avoid “pay when paid” clauses and include a clause that allows you to stop work if a scheduled payment isn’t met. Keep your draw schedule in as small an increment as you can to reduce your liabilities should something happen with the General contractor. Remember, people are going to treat you how they perceive you. Make sure they see you as the best that they can get for the job. They’ll gladly pay for that.